One of the hot areas of biological research these days is the structure of the mammalian brain. You would think that scientists would know a lot about how it actually works beyond its appearance and general structure, but that is not the case - or, at least, they do not know as much as we would like. The Allen Institute for Brain Science has been studying how the mammalian brain is wired. They have focused on the mouse brain, which has 75 million neurons arranged in somewhat similar fashion to how the human brain, which has 100 million neurons, is structured. They studied 1700 different mouse brains. Before this project, the only wiring diagram (called a "connectome") was for the simple earthworm (C. elegans) that many of us dissected in biology class, which only has 302 neurons. Obviously, this is an important step forward in understand the human nervous system from the ground up and could have immense practical applications as the research moves forward. Treatments for many diseases, such as Parkinson's Disease and Lou Gehrig's Disease, could benefit from understanding the work of neurons. The procedure was to use genetically engineered viruses to track individual neurons and how short and long-range connections worked together. This required advanced microscopes that could see down to less than an individual micron. The best part of the project, and the one that interests us here, is that the Allen people created a "Mouse Brain Connectivity Atlas" which shows in 3D animation what the different neurons are connecting with as they function. The movie above displays 21 mapping experiments from the Allen Mouse Brain Connectivity Atlas. 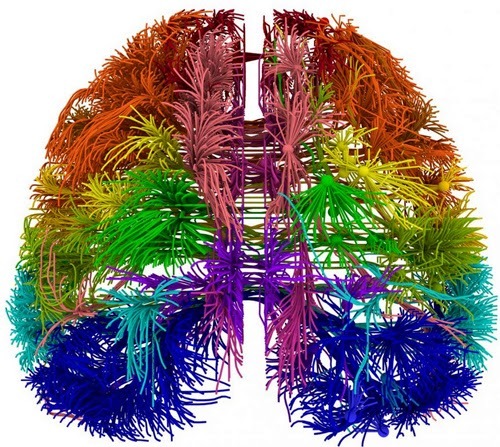 The density of axons at each voxel (dot) are displayed as overlapping circles color-coded by the area of the brain from which the axons are projecting. This animation shows how projections from different regions of the cortex divide the thalamus and striatum into distinct domains. Results included discovering that there are connections between the two hemispheres of the brain that are mirror images of each other on each side. Other functional circuits have different, unique pathways. This is just a first step. As time goes on, the data will be increased and the animations will become better. It's an interesting step forward in medical research and animation. Pages such as this reflect our continuing efforts to show the importance and variety of animation in the many different applications that it supports.